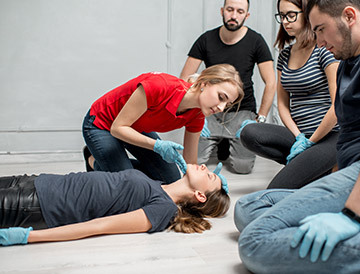 Employers have to risk assess their workplace first aid requirements, and the 1-day Emergency First Aid at Work (EFAW) qualification is one of the statutory qualifications for this purpose. If the risk assessment indicates that employees may be faced with life-threatening incidents where they have to manage the casualty for up to 10 minutes, or deal with very minor incidents that will not require medical assistance, then the EFAW is the course that meets this need. Topics include; roles & responsibilities, dealing with collapse (with and without breathing), choking, bleeding, shock, seizures, minor workplace incidents, using first aid kit. This qualification is designed to provide essential life saving skills. Typical delivery methods are predominantly practical and the course is assessed by continual observation of candidate performance and a brief Multiple Choice Questionnaire.